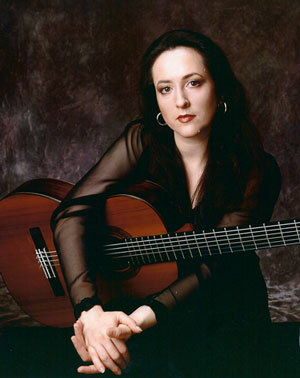 Virginia Luque plays classical and flamenco music in a Spanish romantic style, combining extraordinary technical virtuosity with beautiful tone and musicianship. Ms. Luque has recently recorded Rodrigo’s Concierto de Aranjuez with the London Symphony Orchestra at Abbey Road Studios. She has been awarded First Prize at several international competitions, including the “Manuel de Falla” Competition for Classical Guitar in Granada, Spain, and has received the Lincoln Center Scholarship among other awards. Concerto performances have included the Concierto de Aranjuez with the New York Virtuosi Orchestra, the Hartford Symphony Orchestra, the North Arkansas Symphony Orchestra, Riverside Symphony, the Seoul Symphony Orchestra, the Izmir Symphony Orchestra, Antalya Symphony Orchestra and she has premiered her own concerto with the Alexandria Symphony. Recitals have included Carnegie Hall, Town Hall, The Metropolitan Opera House, The Frick Collection in New York City, and numerous concert halls throughout the United States. She was also invited by Christopher Parkening to do a special guest recital at the Christopher Parkening International Master Class at Montana State University. A native of Algeciras (Cadiz), Spain, Ms. Luque began playing the guitar when she was four, started formal training when she was six, and gave her first concert at the age of seven. After hearing her play, Ms. Luque was invited by the legendary Spanish guitarist Andres Segovia to study privately with him. She received her Master’s degree in Spain and at Segovia’s suggestion came to America where she also received a Master’s degree from the Juilliard School in New York City. Ms. Luque’s other pursuits have garnered her a First Prize in the International Competition of Poetry based in Puerto Rico and she has also graduated as “Chef” from the French Culinary Institute of New York.